He was a legend at 12 years of age after completing a feat that only one other has ever done. Now, as he turns 16, Jack Sock is ready for a comeback. 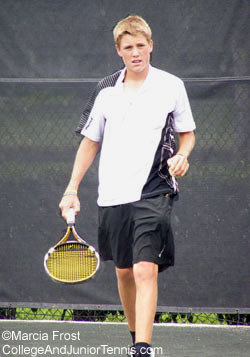 In 2005, Jack Sock won the singles and doubles of all the majors in the 12s. (He had also won the doubles at the Hardcourts and Claycourts in 2004.) This had only happened once before, in 1981 when Al Parker did it, and it hasn't happened since. Unfortunately, the reign of perfection for the Nebraska native would not continue as injuries began to plague him. There was a long road of recovery between the 12s and the 16s, and though Jack Sock did get a few matches in, his 2006 ranking plummeted to 241 in 14 singles and 179 in doubles. Then it all started to come back together. In February 2007, Jack took the consolation at a National Open, then winning doubles at the Easter Bowl and the National Claycourts. By August, Jack was back in the groove with another Gold Ball from the Hardcourts, and a third place showing in doubles. He also picked up a title at the November 2007 National Open -- in the 18s. Jack was back and he finished the year in the top 20 of the 14s and at No. 6 in double with frequent partner Mika De Coster. Jack Sock is showing no sign of problems in 2008 as he transitions into the 16s. He started the year with two titles in February (a National Open and the Columbus Indoors), and followed it with yet another Gold Ball from the Easter Bowl/USTA National Spring Championships. There were two more National Open wins leading into the summer, followed by two doubles trophies at Nationals -- third with Mika De Coster at the Claycourts and fourth with Spencer Simon at the Hardcourts. I sat down with Jack at that event to talk a bit about the past, present and future.